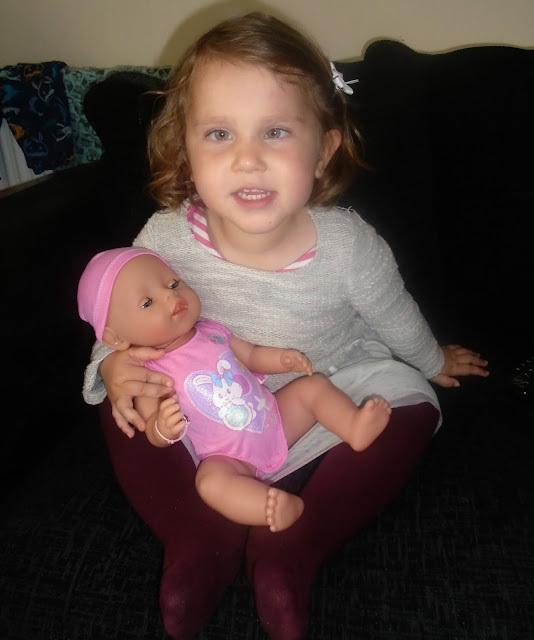 Evelyn has reached that age where she adores dolls and babies so when we were recently offered the chance to review one of the dolls from Zapf Creation I knew Evelyn would be only to happy to help! We received the BABY Born Interactive doll. The BABY Born Interactive doll is a hard bodied doll which comes with plenty of accesories. 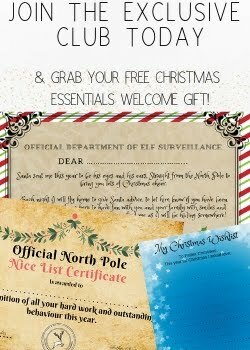 Included in the box with the BABY Born is 1 body suit, 1 hat, 1 plate with spoon, 1 bottle with lid, 1 potty, 1 dummy, 1 nappy, 1 portion of porridge, 1 friendship bracelet each for your child and the doll and a birth certificate. 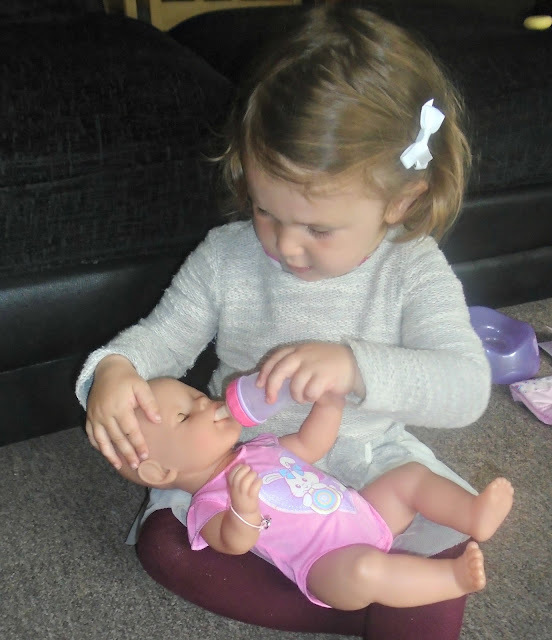 The BABY Born interactive doll is a good size and weight which definitely makes this doll feel more realistic than other dolls we have had. It feels sturdy and has movable arms, legs and head. One of the reasons we went for a hard bodied doll is because Evelyn likes to take her dolls everywhere including the garden and the bath! BABY Born is able to do all this and be easily wiped down is needed which is a big bonus. The BABY Born doll has several interactive features including the ability to cry, wee and poo, the doll is for children age 3+ although as Evelyn is only 2 she wasn't to interested in these features just yet and was happy to just pretend. As I mentioned the doll is aimed at children age 3+ and Evelyn is only 2 but she got on just fine with the doll and really loves playing with it. We did have a go at making it cry but found it quite difficult and I would imagine a child would find it quite difficult to apply enough pressure to make tears appear on their own so this may require some help from a grown up. I would have loved to have had a few more nappies/ portions of food for the baby in the box as the set does only come with 1 of each of these and they were used quite quickly. However I have noticed you can purchase these separately so if you are thinking of purchasing this doll I would definitely recommend purchasing some of these at the same time to go with your doll. The BABY Born Interactive doll is currently priced at £44.99 and we think its definitely a worth while investment. I can see Evelyn spending years playing with this doll and with so many accessories to buy for it and outfits to change there is always plenty to add to your child's doll. It is great for role play and imaginative play and being such a sturdy doll is made to last. Do your children like dolls? I loved my dolls sooo much when I was younger, I can't believe Baby Borns are still going strong!! Evelyn is so cute! She looks so pleased with her doll! Having a little football mad lad I don't get these pleasures, only mud and footie boots. I loved dolls when I was younger, this doll sure does look sturdy which I think is great because it allows it to last longer! Oh I remember my childhood I used to play a lot with my sister, My dolls always lasted years until I was older and then I just donated them.